Every dream begins with a single thought, a single step, a single decision to try. When hope doesn't seem to bring our dreams any closer... When giving up feels like the right step to take next... What can we do when faith in our dreams gets shaken? What can we change in order to move closer in the direction of our dreams? One of the most important aspects to examine before deciding to give up is whether or not the road ahead will be detrimental to our well-being. Know that giving up people or situations that no longer serve our greatest good can actually be a wise choice. What can hold us back is when we decide to give up because of our fear of the unknown or in other words, fear of an uncertain future. Perhaps because of painful past experiences or perhaps because of friends or even families that create fears and limitations based on their own personal perspectives. our greatest good can actually be a wise choice. What we need to remember when we are on the verge of giving up is that each and every one of us is unique. We are essentially made of different layers, and those layers transform with each experience that we encounter. Whatever blocks we have been coming up against or pain we have been feeling will always pass and we will survive. Whatever didn't work in the past doesn't mean that we are doomed for life. Even if we believe that some scars last for life doesn't mean that we will be the exact same person for the rest of our lives. When we persevere, we get to know ourselves better and discover new layers within ourselves that we didn't know we had. When we open our mind and heart to new opportunities, we open ourselves to new, unseen possibilities. As we recognize that everything in the world has a rhythm, we will see that beneath each struggle lies an opportunity to transform ourselves from who we are to who we really want to be. we will be the exact same person for the rest of our lives. Happy Full Moon! The Moon in Virgo is forming an opposition to Neptune, the Sun, Chiron and Mercury in Pisces, marking a super earthy yet otherworldly Full Moon in the sign of the Virgin. Striking a balance between the material and the spiritual is needed to up our self-awareness to the next level. 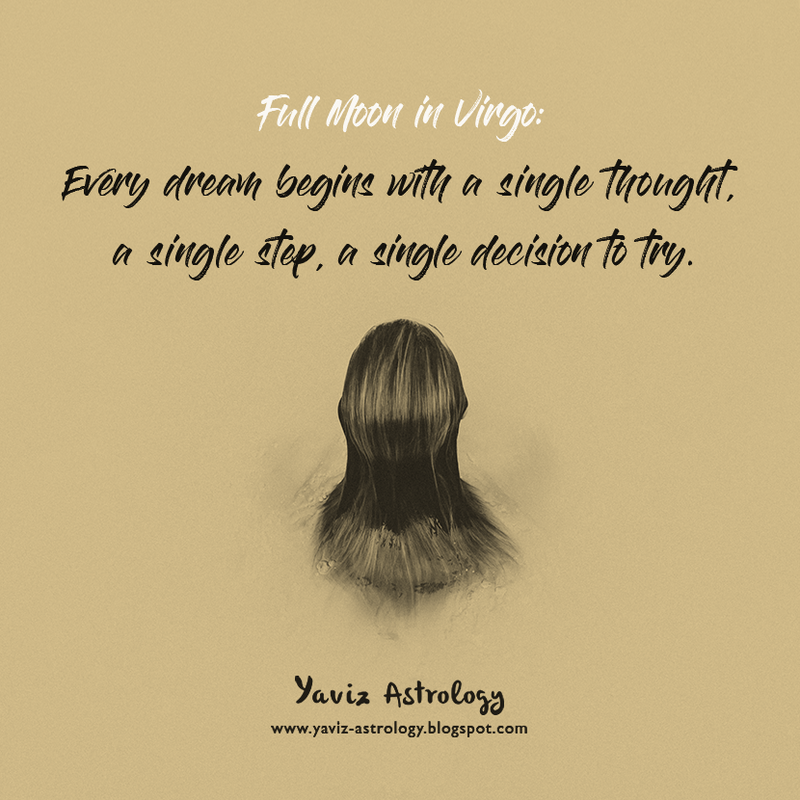 A Full Moon in an Earth sign presents a culmination of practical steps we have taken since the last New Moon. Are we happy with the fruits of our labor? Or do we need to find ways to step up our game? Perhaps we have done our best but there still seems to be a lot of work to be done. This Full Moon is about realizing that to keep up with our dreams, we need to cultivate the right mental attitude. This is no longer about whether or not we have done our best, but whether or not we have discovered the spiritual wisdom within our persistence. needed to up our self-awareness to the next level. The Moon is forming a trine to Mars and Pluto, and we can confidently move forward, knowing that darkness can no longer hide the light of awareness. Imagine how would our lives be different if other people's opinions were of no concern to us? How would we handle each day differently if we lived faithfully to our truth? We were gifted with the power of authenticity. By living our truth, we can peel off layers of illusion and stop letting others dictate our worth. By living authentically, we can be liberated from belief systems that keep our minds imprisoned and recognize which way we are being pointed — giving us the confidence to move forward on a path most aligned with our highest good. and stop letting others dictate our worth. With the Moon's square to Saturn, evaluation of the past along with the lesson that we've learned will enable us to rebuild a new and more solid foundation for our future. Do not let painful memories to intimidate us into quitting. Blocks often appear on our path to move us in a new and different direction. The Full Moon in Virgo is bringing to us the reminder that surrendering to the unknown is where the magic currently resides. Even if we are unable to see what is ahead, cultivate curiosity rather than resisting change. Even if things do not go exactly as we plan, truly notice and appreciate the deeper messages offered. Know and trust that what seems like an ending is always an opportunity for a new beginning.